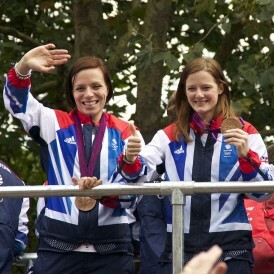 Kate Walsh and Helen Richardson placed third in the London 2012 Olympics. Now, with a five-year relationship under their belt, the two British Olympians are set to enter into a civil partnership on September 14, 2013. Walsh, captain, and Richardson, a midfielder, became engaged in January and plan to have their ceremony in Henley-on-Thames, near where they live. Though the entire hockey training squad is invited to the wedding, Walsh is hoping to avoid the “cheesy” guard of honor with hockey sticks. Posted September 10th, 2013 & filed under Sports.